Why a Smoke Free Park Policy for Sisseton Residents? The City of Sisseton values a safe and healthy environment for all its citizens. The Smoke-Free Parks Policy prohibits park patrons to refrain from smoking within the bounds of any City park. According to the U.S. Surgeon General, there is no safe threshold of exposure to second-hand smoke. To the extent possible, it is important for the City to take action to prevent park patrons’ exposure to this dangerous health hazard. Children may be especially vulnerable, which is why the Smoke-Free Parks Policy is specifically targeting areas where children congregate. The primary focus of the policy is to ask park users to respect our community values related to a healthy and safe environment by helping us to reduce second-hand smoke exposure in parks. The local children and youth thank you for your cooperation! Did you know? Smoke-Free Parks makes sense! · According to the U.S. Surgeon General, there is no safe threshold of exposure to second-hand smoke. It has over 4,000 chemicals in it, and most of these chemicals are toxic and cause cancer. · Parks are healthy places for youth, families and community. The more tobacco free places we have the fewer opportunities youth have to start using. · The Smoke-Free Parks Policy promotes positive role modeling. Adults are role models and the more youth see tobacco use, the more it becomes an accepted norm and the more likely they are to use tobacco products. 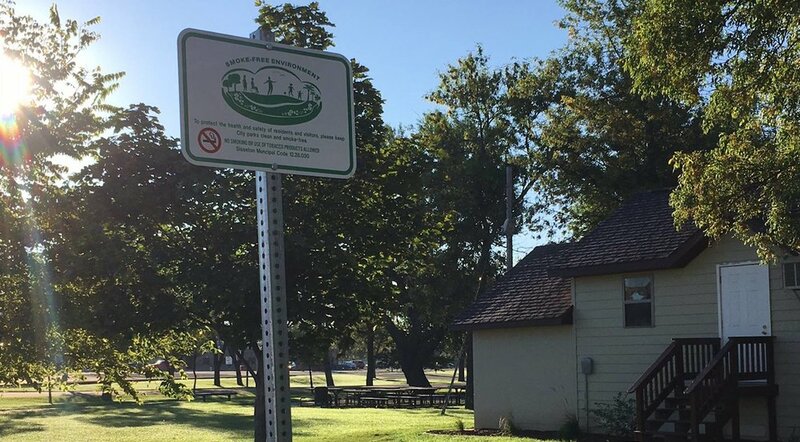 · The Smoke-Free Parks Policy reduces litter. In smoke-free parks you won’t see discarded cigarettes that pollute land and water. Further, discarded cigarettes are often ingested by toddlers and pets and they diminish aesthetics of parks and nature and cost the City in additional maintenance expense. Need help to quit commercial tobacco use? Call the South Dakota Quit Now Hotline at 1-866-SD QUITS (1-866-737-8487) or request a call from a coach at www.sdquitline.com. This is a free service provided to South Dakota residents aged 13 and older. Calls are answered from 7 am to 11 pm Central time Monday-Friday and 8 am to 5 pm on Saturday. Voicemail is available 24 hours a day, 7 days a week.